Now that we are home, learning our neighborhood is very important. 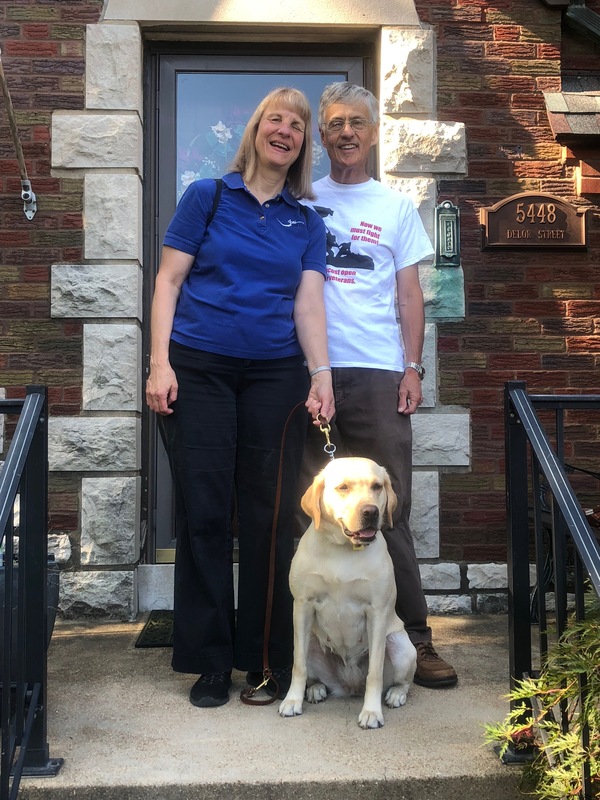 My first seeing-eye dog, Velda, passed away two-and-a-half years before I got Thelma, so learning the neighborhood together with Thelma is a new adventure for both of us. It was a sultry Saturday afternoon. We decided to start learning my route to work. This is a 16-block route, and there are some interesting irregularities on it. We walked down our street, turned right and crossed the corner. Thelma saw the wide expanse of a concrete patio in front of a store and, understandably, treated the whole thing like a sidewalk. Since I didn’t actually want to go into this particular store, I had to show her where I wanted to end up after crossing the street. So we went back across the street and repeated the process, reinforcing to her where the real sidewalk was. My husband, Ray walked a few feet behind my right shoulder and alerted me to anything he thought I should beware of, such as cracks in the sidewalk caused by a root; construction; lime bikes, etc. Thelma skirted around most of these obstacles or took me past them without difficulty. A few times I had to stop, show her the obstacle and praise her for seeing it, then take a few steps back and have her walk past it again to reinforce the learning. Then we encountered construction, and it seemed we might need to cross the street to avoid it. After traveling about eight blocks, we decided not to walk to my new office, but instead to turn left and walk to our friends’ house. They were working in their yard when we got there. We talked for a while and then started the trek home. About three blocks from our house, the rain came and so did the thunder and lightning. Thelma just kept walking without a hitch, and I picked up my pace beside her. Ray almost had to run to keep up with us! When we finally arrived home, we were drenched… but we were safe. I was glad to know that my dog wasn’t afraid of a little rainstorm. Thelma had already proven that several times in the short time we’d know each other. This was actually the sixth downpour we had traveled through together since our training began three weeks earlier. We all dried off as best as we could, got a refreshing drink of water, and continued our day. I realized I was truly beginning to trust this four-footed friend of mine more and more. Most of all, though, I trusted in the Lord to keep us safe during our adventures as we learned more about each other’s traveling habits. And I did forget to thank the Lord for my faithful husband, who also invested time in this training. After that eventful walk, Thelma and I had grown closer together and came away another fun adventure to share with our friends. 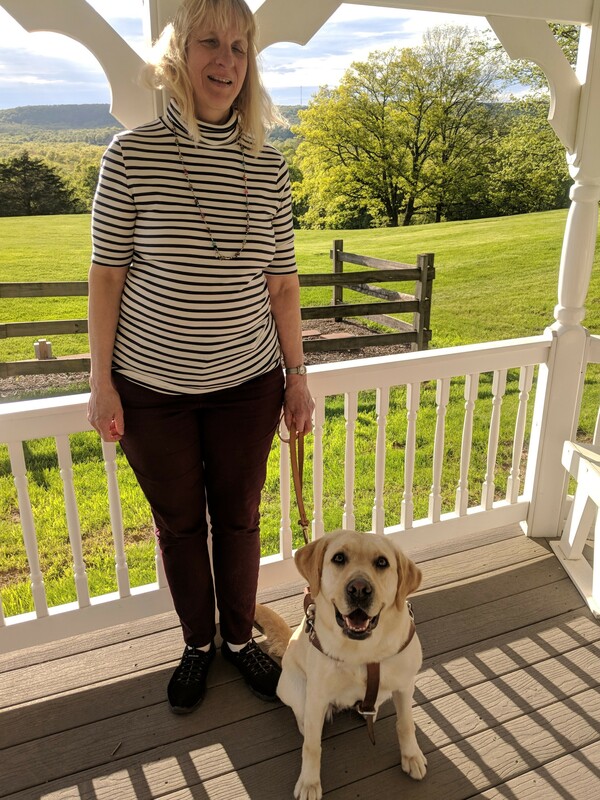 Hello again from The Seeing Eye in Morristown, New Jersey! As we drove to the airport, my instructor discussed some airport basics. Because Velda, my first dog, and I had flown at least 25 times together, I already knew the drill. Due to some new airport regulations, however, Thelma and I couldn’t check in at the kiosk. We had to stand in line for personal assistance. Then at security, the agent had to find someone who wasn’t afraid of dogs. Despite these delays, we arrived at my gate in plenty of time. Persons with disabilities usually are the first to board an aircraft, so Thelma and I proudly followed the airline worker into the jet. After putting our items in the overhead bin, Thelma and I settled in our seat next to the window. I scooted her under the seat in front of me feet-first, so her head was facing me. She shinnied in like a little hot-dog. To avoid discomfort when the airplane took off, I gave Thelma a treat. When we were about to land, I gave her another treat. During the flight, I had a lively conversation with an evangelist. He had just returned from Africa. It was interesting that he had a disabled son, so he was eager to learn about Joni and Friends. When we arrived in St. Louis, the customer assistance personnel escorted me to the baggage claim carousel, where we retrieved our luggage. Soon, my husband Ray arrived to welcome us back to hot, muggy St. Louis. Here we would begin a new adventure, learning my home city together. A new dog for me, a new city for her, and a new office for both of us. That evening, with Ray behind my right shoulder describing objects coming up, the three of us explored a good portion of our neighborhood. Thelma and I certainly had our work cut out for us. It would be no easy task, learning the streets in a ten by ten block area. Learning together how to conquer low-hanging tree limbs, uneven sidewalks, construction and dog distractions. Our neighborhood has them all. The learning curve would be huge, but we were ready. My wonderful husband and son were ready, too, to help us learn our surroundings. They agreed to kick in as travel assistants. In the coming weeks we had many exciting challenges ahead of us. Wait till you read about one in our next adventure! If you are a dog owner, you know that dogs are a big responsibility. Learning how to take care of a dog’s basic needs is so important. Feeding it just the right amount of healthy dog food, giving it lots of fresh water, and providing it with sufficient exercise helps maintain the dog’s weight, keeps it a happy dog and makes you a happy owner. For those of us who have working dogs, continuous training and challenge strengthens our team trust. One of the first things my Labrador retriever, Thelma, and I learned was the importance of practicing daily obedience. Just as the Lord desires us to daily feast on His Word, pray and praise Him, so is it important to teach obedience daily with your dog. This keeps its mind sharp and its basic skills active. Each of us with our dog are encouraged to perform three obedience drills three times each day: come-sit; sit-down; and sit-rest. Grooming the dog’s coat daily keeps its skin oils flowing, its fur shiny and odor free, and eliminates the need for regular bathing. We also work with the dog to establish times for elimination so it will get on a schedule. If something changes in the dog’s pattern, the owner can catch it right away and handle the problem accordingly. I’m happy Thelma doesn’t mind having her teeth wiped daily with dental wipes. When my classmates and I were taught how to get our dogs to take a pill, she didn’t fight me on that, either. Our class had lectures on various topics almost daily. Here are a few of the them: the importance of obedience; dog care basics; grooming; tips from the veterinarian; food and appropriate toys; traffic safety; the dog’s senses and how it perceives things; how to travel on an airplane; dog attacks (WHAT ARE DOG ATTACKS?! ); going home; and tips for a smooth transition. We also discussed advocacy and our rights as guide dog handlers. We even learned about pet insurance. One morning, one of my classmates, Shelby, and I went with our instructor to the park to look at the Morris Franck and Buddy sculpture. Morris Franck was the courageous blind insurance salesman who started the Seeing Eye school. 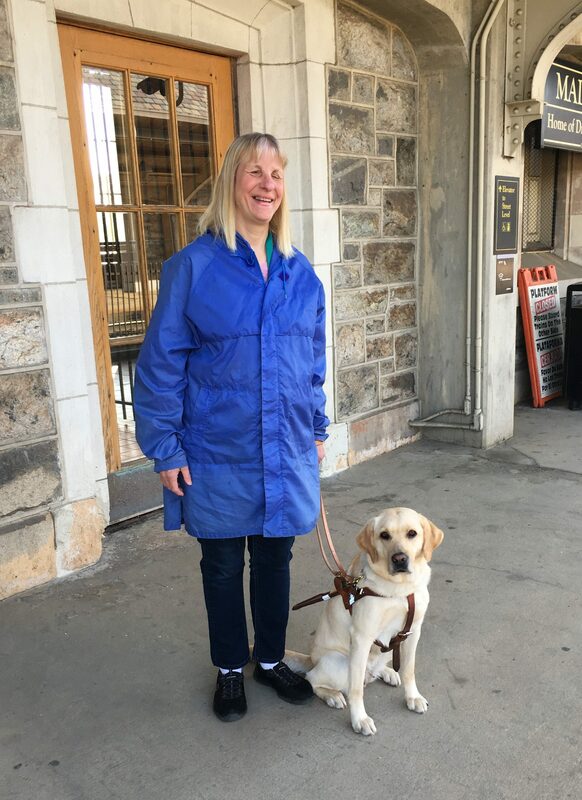 Next year, the school celebrates its 90th year of providing seeing eye dogs to blind persons. As I stood in front of the statue, I thanked the Lord for this man’s tenacity and perseverance. I thought of the thousands like me who had been served by the school because of his persistence. Twenty of us with our dogs walked to the ice cream shop to have a treat together. It was a celebration of our hard work during the past two and a half weeks. Some dog teams were faster than others, but all made it to the store, went inside and sat down in their places. No dogs barked, no dogs stole any ice cream cones and all enjoyed the fellowship during our last afternoon together. And, as was customary for so many of our adventures, it rained the entire time. We were wet walking to the shop but dried off a bit inside as we ate our delectable treats. It felt like we flew home through that pouring rain, showing how much we’d all grown to trust our canine teammates. Were we ever glad to dry off when we got inside. All of us anticipated with excitement our trips home to reunite with our families. 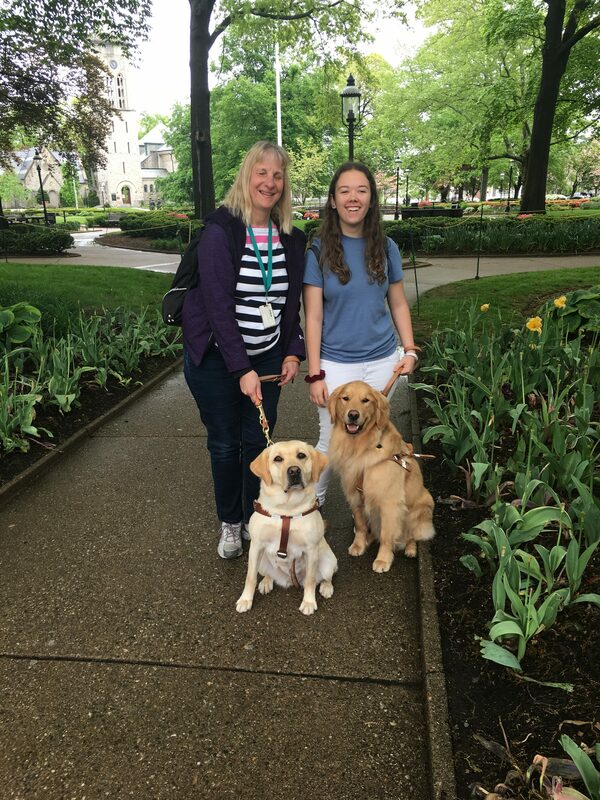 We knew leaving the Seeing Eye meant we’d have to start from scratch acclimating our new canine friends to their new permanent homes, but Thelma and I were up to the challenge! You’ll hear from us again soon. Here’s another Adventure with my new 4-footed friend. In this adventure, we are still in training at the Seeing Eye School. The second route we had to master was the Elm Street route. In my estimation, this route was twice as hard and twice as long as the first one! The traffic was twice as heavy, too, and there were lots of hills on this route. In a couple of spots, we had to teach our dogs how to find the pole that had the button to press that allows us to cross the intersection safely. After the button was pushed and it was time to cross, the speaker on the pole said, “Walk…walk…walk” for a certain amount of seconds so we could cross. We also had lots of random traffic checks. This is where a car suddenly pulls out of an alley or driveway in front of you. Other dogs were always trying to distract our working dogs, too. My dog kept her head focused on the route and not on the yelping or barking dog. I was so glad of that! We also had to deal with barriers in the sidewalk, such as those to keep you from walking into a hole or through a construction site. After we passed our solo walk on our second route, we started to do more individualized training. The first thing Thelma and I did was to go to Century 21 department store. We walked several blocks to get to the store. Inside the store, we followed our instructor, who pretended she was the store clerk helping us. We “followed” her throughout the store. This is how “follow” works. If I have a store clerk or friend helping me through the store, I tell my dog “follow”. The person in front of me just talks with me, telling me what we are passing, talking about the weather or anything so I can hear their voice. They may warn me of steps coming up, an escalator, etc. I give the dog its direction based on what my human leader says or does. Even following someone with loud shoes works, if they forget to talk to me. Anyway, at the store, we took the escalator and both of us, dog and master, learned the skill so the dog’s toes would not get caught in the moving escalator. We toured a grocery store, too, learning different methods of using the dog with a shopping cart. We went to the pet store and bought a few items, including a dog tag with our dogs’ names and contact info on them. We even took a stroll through the dog food aisles, past the pet clinic, and past the grooming area. Then we walked a half a mile to the bank. Inside we learned how to maneuver through the crisscrossed line maze to the counter. As you know, these portable line guides are often in airports and other places where many line up. It took a bit, but Thelma finally got it. And I finally got it, too. Our class of four also went to the mall, about 15 miles away. We individually learned how to find or shop for various things in the mall, per our interest or need. I learned how to teach Thelma where the elevator is with my clicker. The clicker method helps you teach the dog how to find a specific thing like an elevator, a stoplight pole, or your specific chair at lunch. The method has a three step process: association, back-chaining, and completion. Using treats during each step of the process to show and reinforce the behavior you want is essential. We learned how to travel on country roads. One route had no sidewalks, only curbs. The other was a paved road with gravel on the sides. Each was very different, but on both we used the same technique. It involved using the white cane at times in tandem with your dog to make sure you were walking along the side of the road and not in the middle of it. The training at the Seeing Eye wouldn’t have been complete without a night hike. My instructor chose a partially familiar route. The 9-block route included finding your way through a parking garage, weaving through pedestrians and outdoor cafes in a busy nightlife section, avoiding overhead tree branches, and other sidewalk obstacles. Crossing the same streets we crossed in daylight was different, too. Traffic patterns changed and sometime the street traffic was so quiet it was hard to get a good reading on when to cross. It was a great adventure, and we both enjoyed it emensely. The Seeing Eye campus itself had a leisure path. It contained hills, valleys, turns and even two gazebos where we could sit and relax, enjoying the fresh Morristown spring time air. It was also designed so we could walk with our dogs without assistance, giving us more training in how to work as a team. Check out our pictures. Hello from Morristown New Jersey. We’ve been so busy I haven’t had time to send you any new adventures until now. Let me tell you about our team. As I mentioned in the previous adventure, there are 21 students in our class. We have four persons in our team with one instructor. We ate meals together the first week, and we work together as a team, in pairs, or separately with our instructor for the duration of the training. Training for those who have already been Seeing Eye dog handlers is 17 days. New students get an additional week, either at the school or in their home town. On Wednesday, when we received our dogs, we spent time getting to know them individually in our rooms. After lunch, we started on our first route. This was a 9 block route in downtown Morristown. Each of us went individually with our instructor to learn the route. We walked the route with dog and instructor 5 more times in subsequent days, familiarizing ourselves with it. Our instructor gave less instructions each time. We concentrated on traffic flow, both parallel and perpendicular. We learned which streets had controlled lights, and which had none. 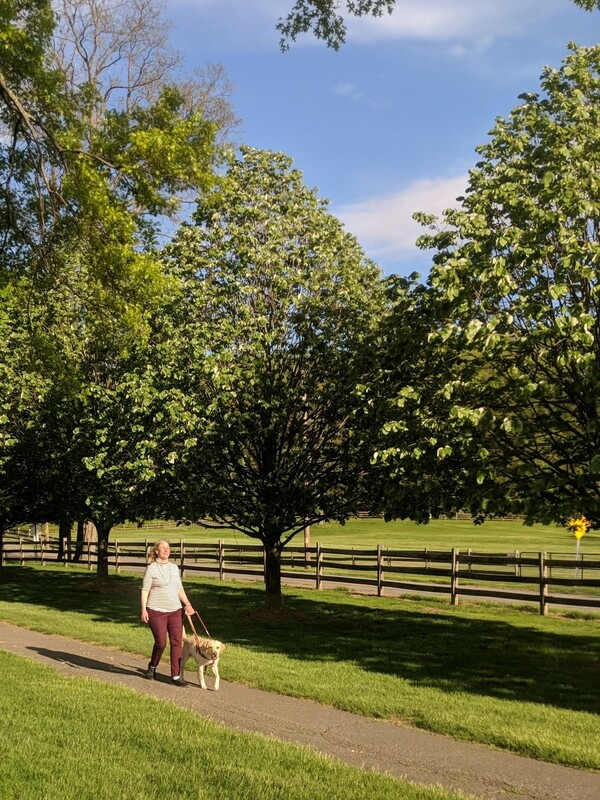 As our trust grew in each other, the route became easier and we began to enjoy the sounds of spring and fresh Morristown air as we walked swiftly along. On Sunday, in the pouring rain, we soloed our route. That means we did it on our own, with our instructor following at a distance, only giving instruction if our lives were in danger. Thelma and I could not avoid the 3 inch puddle at the beginning of one street crossing. We also got unexpected traffic checks, when a car came out of a driveway in front of us. A block further, we politely stopped to let passengers get out of their car and go into a building next to us. We then continued on our way. As we turned the corner onto our last street, we increased our pace anticipating our route’s end. We turned left into the alley. Soon, I told Thelma “left, left”. Obeying, in a bit, Thelma stopped and her nose was right under the door handle. I gave her lots of praise as I had become accustomed to doing. We went inside, wet, but triumphant. What was a little water when you together conquered the challenge? Maybe, just maybe, this yellow lab would walk with me another 6,000 miles like Velda did! Another adventure with my NEW four-footed friend. You’ll hear from us again, soon, and a picture. 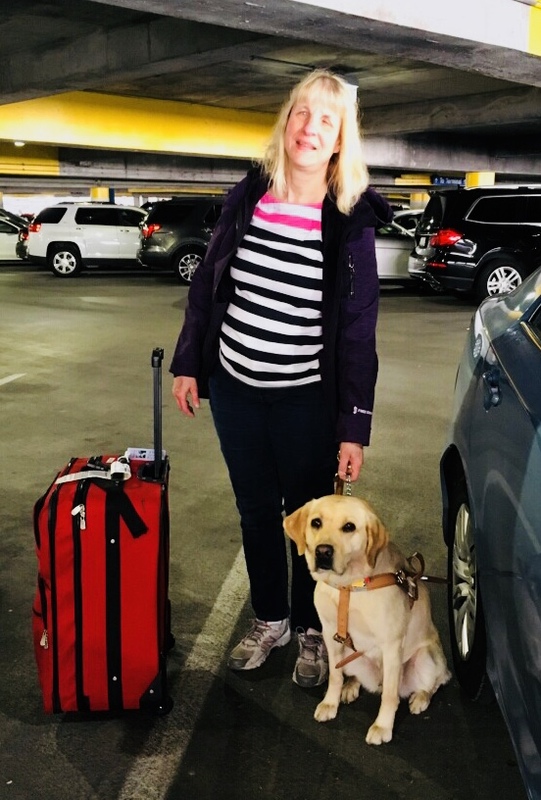 As I flew to New Jersey on Monday to spend the next 18 days training at the Seeing Eye School with my new dog, I remembered 12 years ago when I made the same trek. It was in March then and a bit colder. The same excitement flooded me then that surged through me on Monday. What would my new dog be like? Would she be like Velda, who served me for 9 and ¾ years? Would she be a lab, or a golden retriever, or a German Shepherd, or a cross lab golden? 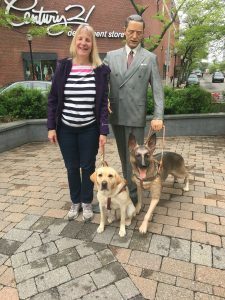 Upon arriving at the airport, a rep from the Seeing Eye met me and introduced me to the other student riding back with us to Morristown N.J. On the ride back, Nolan and I chatted about our families, lives, and our dogs. Our instructors met us at the door, took us to our rooms, and helped us get oriented to it. I was even more amazed this time. The dorm had been renovated and there was Braille everywhere, including building lay-out maps. I remembered the raised wooden terrain street map they had last time so we could figure out our walking routs prior to taking them. I couldn’t wait to explore those maps again. We all ate a delicious lunch together. Other students had arrived already and some of them joined us for lunch. Soon it was time for my Juno walk. This is when my instructor pretended she was the dog. She took the other end of my leash and the harness. She walked on my left, alongside me just like a dog would. She’d vary the pull and pace in order to solidify which dog would be the best match for me. Over the next day and a half, each of us 21 students did 4 Juno walks in all. We were divided into groups of 4 and each group was assigned an instructor. We eat together, have individualized training together and more. We also have class lectures, every evening. Wednesday morning after breakfast, we received our dogs. Mine is a yellow lab with honey highlights. She’s the same size as Velda was when I got her in March, 2006. She’s a fun-loving dog who loves to serve. We did our first 8 block trip in downtown Morristown. Right now, as I’m writing this, she is sleeping in her crate after a long, exhausting day. Since our day tomorrow begins at 5:30 a.m. I’m signing off, too. Will write more soon.